Istanbul always takes my breath away, especially this week since I had the time to be a tourist in my home city and visit some sights I haven’t had a chance to in years. The food (Turkish food is my fav ever!!! ), hanging with my friends, and fashion were all on point that week – despite the extreme heat wave – and I’m definitely going back to Cali completely refreshed and inspired! Even in just one single neighborhood in Istanbul, you can find so many historical sights and beautiful things to see. I wanted to shoot in this particular area of Istanbul called Sultanahmet because I knew I wanted to show my followers the beautiful architecture of the city. This historic region has so many picturesque places like the Hagia Sofia (Blue Mosque), Basilica Cistern, Topkapi Palace, Sultanahmet Mosque and many more sights that were built centuries ago. If you don’t know much about Istanbul or its rich history, you can read my Istanbul guide here. The weather in Istanbul was pretty hot for September, so I spent most of the week in mini skirts and dresses. The star of this look is the embroidered skirt. It’s another piece I got from Topshop before I left and I feel like it matched perfectly with the historical vibes of Istanbul. 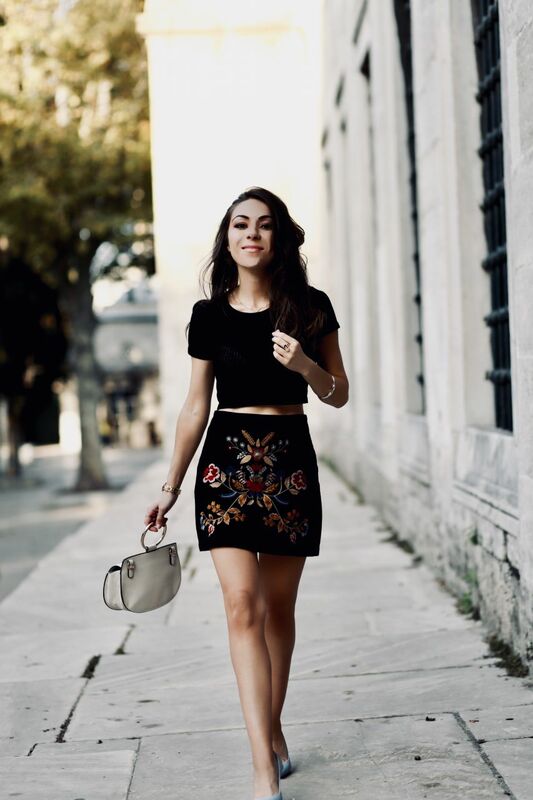 Since Istanbul and the Ottoman Empire’s culture has so many prints and flowers, I knew I wanted to photograph this skirt in historic locations. I’ve styled it with a Topshop crop top from years ago and these baby blue pumps from Aldo which are one of the three pairs of high-heels I brought with me on this trip.